Agios Stefanos Beach is a small stretch of sand complete with sunbeds and umbrellas in the northwest of the island next to the new port of Mykonos, Tourlos, at a distance of 3,5 km from Chora. This beach is probably a solution for those who do not have their own means of transport and do not like moving around much. It is a family orientated beach with easy access to the water. Water sports are available and not the whole stretch of Agios Stephanos has sunbeds , there is also a part where you can just lie your towel in the sand. The beach is named after the pretty church with the red roof that you see at the end of the beach. Agios Stefanos beach is surrounded by tavernas, fish restaurants, hotels and villas to rent. 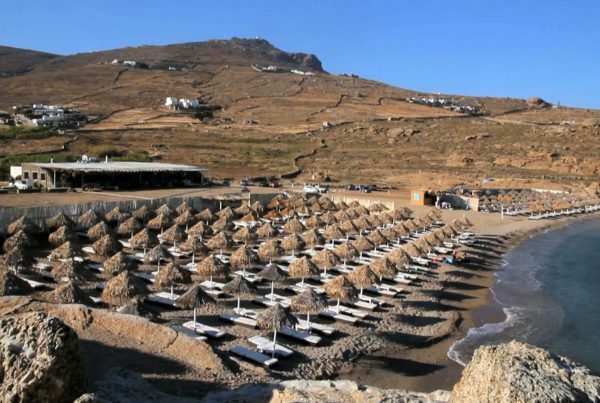 From the beach there is a view of the big cruise boats that dock at Tourlos port, as well of the historically important sites of Dilos island and Rhenia island.